Donnie was SO afraid. He KNEW what he had to do, but couldn't seem to get the COURAGE to do it. Then he remembered his Sunday school teacher's words: "God has promised NEVER to leave you alone. He has promised to always stay by your side." "Maybe what I need to do right now is kneel beside my bed and ask God to help me," Donnie thought to himself. When he got up from his knees, Donnie felt SO much better. He knew, with God's help, he COULD do it! Can you think of a time when you were very AFRAID to do something you knew you HAD to do but really didn't WANT to? Did you stop to pray and ask God to help you so you could have the courage to do the right thing? It's not always EASY to do the right thing, but it's always RIGHT! Esther leaned against one of the tall pillars and sighed heavily. This was HARDER than she had expected. The three days of fasting and praying were over, and she was going to see the King. No one had stopped her — not yet at least. She pushed her hair out of her face and took a deep breath. 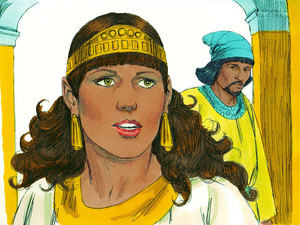 Her servants had made Esther look very pretty to see the King, but she was still VERY nervous. After all, the King only saw people he INVITED and NEVER allowed anyone to come at the spur of the moment, without his telling them to come. The only exception would be if the King held out his golden scepter. Then the person's life would be spared — but ONLY then. Esther walked away from the security of the pillar and stepped into the throne room quietly. King Xerxes sat on his throne talking to his advisors softly. When he saw Esther approaching, the room became [WHISPERING] VERY quiet — even QUIETER than it had been before. A broad smile spread across the King's face. Esther felt relieved as he majestically held out his golden scepter to her. Esther reached out and gracefully touched the top of the golden scepter. "What is it that you wish, Queen Esther? Whatever you want, you will get, even if it is HALF my kingdom," King Xerxes said with a welcoming smile. Esther swallowed and said in a rush, "My lord, if it please the King, would you and Haman come to a banquet I have prepared for you both today?" King Xerxes smiled even wider. Esther smiled back. "I think it's going to work," she thought to herself. The King turned to his aides and said, "Tell Haman to hurry and get ready that he may do as Esther has said." 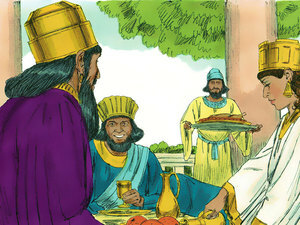 So the King and Haman came to Esther's banquet. King Xerxes knew Esther wanted to ask some sort of favor of him, so he asked her again what it was. "My Queen, what is it that you wish for? I will give it to you, even if it means HALF my kingdom." Haman was proud that he had been invited to both banquets — he and no one but the King — but, as he was leaving the palace, he passed Mordecai outside the gates, who STILL refused to bow. He was VERY angry, but did not say anything. 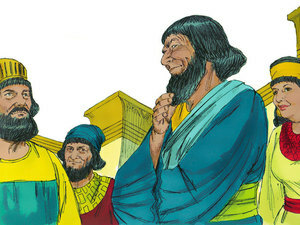 When he got home, Haman called for his friends and family, and bragged to them about how wealthy he was. "The King has promoted me above all the princes and servants," he boasted. "Queen Esther let only ME and the King into a banquet with her tonight and I am invited again TOMORROW night to be with the Queen and the King." But there was MORE than bragging. Haman came home VERY upset about Mordecai the Jew, who kept getting under his skin. He went on and on about how Mordecai NEVER bowed to him and REFUSED to stand and give him the respect he thought he deserved. Then his wife made a suggestion. "Make a gallows seventy-five feet high and tomorrow ask the King for permission to hang the man! Then you can be happy at the Queen's banquet." Haman was SO pleased with this suggestion, he had the gallows made the VERY next day. That night, the King could not sleep. He called to his servants to bring him the history book telling of the most important events of his reign. 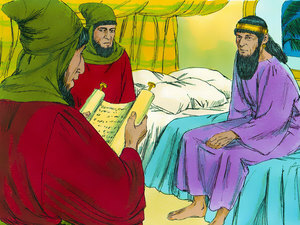 As the servants read to the King, he noticed the item about how Mordecai had saved his life, for he had been the one to tell him about the plot through Esther. "Stop! Wait a minute!" 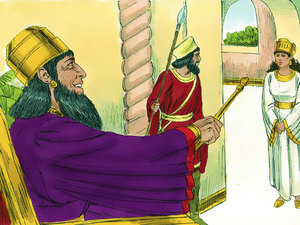 King Xerxes commanded. "How has Mordecai been rewarded for this?" "My lord, nothing has been done for him," they replied to the King. What do you think King Xerxes will do to reward Mordecai? What would have happened if the King had not held out his golden scepter to Esther? Have you ever been jealous over someone else? Did your jealousy hurt YOU or THEM? Tell about a time you've been afraid. How did God help you? Whenever you are afraid, you can cry out to God and He will help you. "I sought the Lord, and he heard me, and delivered me from all my fears"
love me. In Jesus' Name. Amen. Last updated June 24, 2018.